« Wishbone Ash is getting closer! 7th August 2018 LATEST NEWS!! It was NOT finished…. the spotlight above Andy Powell had been taken down a half tone too far so I used my oldest and thinnest palette knife to carefully scrape off part of the glaze to restore some luminosity to the spot-light…. 3rd August 2018 There’s good news and bad news….the good news is that the painting which I’ve been working on over a number of weeks was finished this afternoon. The bad news is that I will NOT be exhibiting at Ashcon 2018. I have thoroughly enjoyed exhibiting Wishbone Ash inspired paintings, drawings and prints at Ashcon 2016 and 2017 but I have a clash of dates this year! Before the Wishbone Ash UK tour dates were published I applied to exhibit at the Manchester Art Fair 2018…..I have been accepted but it clashes with Ashcon 2018. The painting below was to be exhibited at Ashcon 2018 but it will just have to wait until Ashcon 2019…. I was keen to capture the glorious colours in the back-drop and of course to try to use the poses of the band to express the atmosphere of this particular Wishbone Ash gig. I wanted Joe Crabtree and Mark Abrahams inclined towards Andy Powell and Bob Skeat who in turn face towards Joe and Mark. I hope to have captured the self-assuredness of Andy, who seemed to exude a calm confidence throughout the gig. This was the last gig of the UK tour and I’ve since discovered that Andy was unwell in the days following this performance. Well, you would never have known that he was about to come down with the flu…he looked in total command and I wanted to show this through the confident pose-Andy Powell just squeezing exquisite notes from his Flying V. Speaking of Flying V’s, the white V in the background provided an opportunity to place Andy’s dark clothing against the light (visual not aural) tone of the guitar. In a previous painting inspired by the band I had Andy and Bob in a sort of “jamming” pose which was much more animated and whilst I wanted to express something of Bob’s positive vibe in this work, I wanted to keep his positive vibe under-stated. Hopefully his very slightly animated posture is enough to express the warmth of his stage presence. The staff at The Grand Venue allowed me to sketch and photograph from an elevated position providing me with a much better chance of including Joe, who is often almost completely hidden by the drum kit. Joe Crabtree always seems so professional, strong and reliable in addition to being technically gifted…how on earth does one express this in a painting…well I hope with the use of lighting and the attitude of the figure I have succeeded in getting somewhere near. Finally, the figure of Mark Abrahams with his Strat. It was great to see the most recent member of Wishbone Ash. For this particular painting I wanted to utilize the whiteness of the Strat which I felt worked well with the lightness of the drum-kit and the scratch-plate on both Andy’s guitar and Bob’s (new) Rickenbacker. I wanted to show Mark’s loose “open” stance and contrast it with Andy’s closed “tight” stance. I wanted to capture Mark’s concentration and the genuine “feel” that he has for the music. Over the years I’ve see Wishbone Ash with various guitarists “twinned” with Andy and I have to say that every one has seemed a great fit. Muddy Manninen was a hard, hard act to follow but already Mark Abraham is stamping his own style within the music of Wishbone Ash. 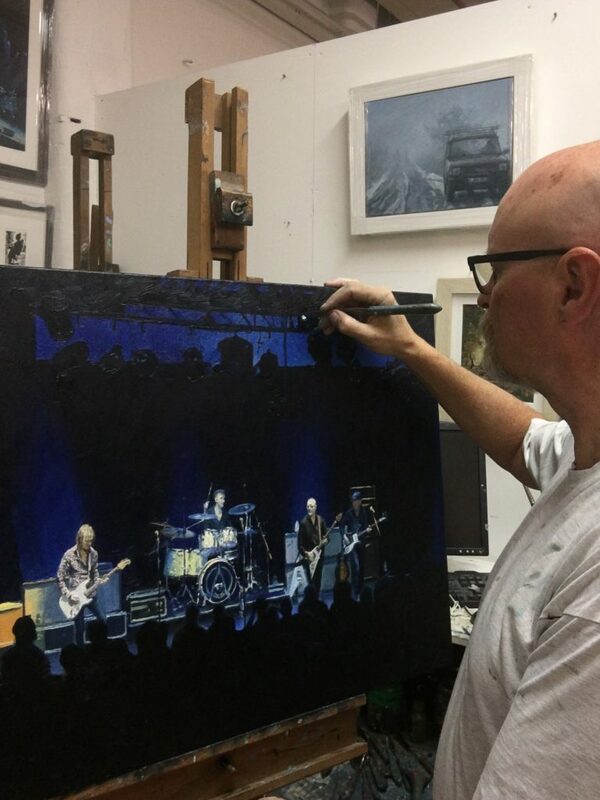 I hope this painting has captured the feel and atmosphere of a Wishbone Ash performance. 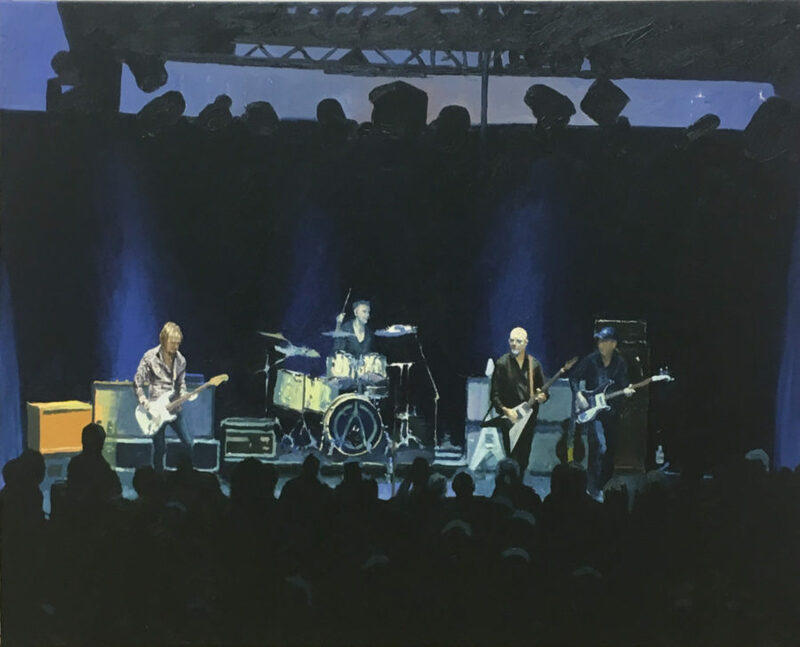 Although I will not be at Ashcon 2018 I will be catching up with the band during the UK tour….hopefully there’ll be another canvas inspired by Wishbone Ash ready for Ashcon 2019.